Single Product for Dual Application. CRF® Restorative Seal is a petroleum oil and water cationic emulsion. 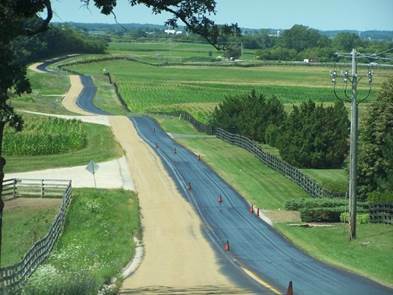 Unlike standard asphalt emulsion, CRF® does not harden or "dry out". Designed as a one component emulsion that effectively repairs cracks in concentrated form, CRF® provides a excellent pavement restorative seal when applied in diluted form. CRF® Restorative Seal is a petroleum oil and water cationic emulsion. Unlike standard asphalt emulsion, CRF® does not harden or "dry out" Designed as a one component emulsion that effectively repairs cracks in concentrated form, CRF® provides a excellent pavement restorative seal when applied in diluted form. CRF® Restorative Seal is a modern sand seal product. Sand penetrates the emulsion and adds additional binder strength. This sand/emulsion combination is kneaded by vehicular traffic to provide a long term seal. CRF® Restorative Seal is superior to standard asphalt emulsions: CSS or SS emulsions. Lower in asphaltene with rejuvenator qualities, it is less receptive to oxidation. Not just designed to "coat" the surface aggregrate, CRF® holds the sand added to it and the emulsion fills surface voids with a very flexible product. How Do You Apply CRF Restorative Seal? CRF® Restorative Seal is diluted with water 2:1 (2 parts product to 1 part water) or 1:1. Typical cure time is 20 minutes to one hour with minimum ambient temperature of 10° C or 50°F and rising. Product stability is excellent. There is a simple procedure to determine the amount of CRF® Restorative Seal that a pavement can absorb by use of a test kit. The kit contains all the necessary materials and detailed instructions on test procedures to determine the quantity and rate of absorption. Restorative Seal: consists of distributor truck application at a predetermined rate of spread, allowed to cure and then sand is applied. Broom Seal/Scrub Seal: application of a predetermined rate of spread by distributor truck, sand application after curing followed by a broom system to even out and work the sand into more of the open areas. With traffic's kneading action, CRF® will tighten up and seal the open areas. Squeegee Seal: is an excellent restorative seal method of initially filling open areas with CRF® by working the product into those areas with a rubber blade. A second application can be made, if required, after the first is allowed to cure. Sand and roll using a rubber-tired roller. This method will seal the surface; repair cracks and distressed sections at a low cost. This application is also used for “high production” crack filling.